Th-INK-ing of You: Take Heart! Hello friends! Happy Weekend!!! I'm excited because I'll get to see my kids/ grandkids this weekend and that's ALWAYS a special joy! 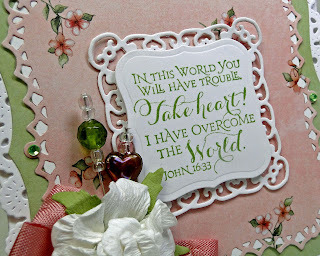 Today I'm sharing a card I made using this month's special release of Scripture Series 3! This is a special set because every year we hold a Customer Contest where YOU submit verses and or sentiments/ quotes you would like to use on a card, and the winners not only get to get the set free, but they get to guest design for the release, sharing a card they made with "their" verse. To see the release and the customer cards created with this set, see THIS POST. I have to say... the verses in this particular set are among some of my all time favorites! Soooo perfect for cards! So this card was especially fun because I just got some new Spellbinders Dies and this is the first card I created using Decorative Labels One. What fun pretty frames!!! I stamped with Memento Ink on Flourishes white card stock, cut with SB Label One. I cut the base for the card with SB Labels One Grand, so the whole card is shaped, though a little of that base is hidden by my Cheery Lynn Dutch Scallop Frame. The designer paper is from a $1.00 Paula Deen pack at Michael's. I made up the stick pins with some beads I had on hand, added some bling and then the seam binding ribbon and Recollections flower. This was a super quick card but I'm pleased with the "feel" of it. I hope you enjoyed it! This is sooooo gorgeous Grace!!!! A stunning card Grace - the sentiment is wonderful. I love the combination of die-cut layers and the lush flower spray! Oh Grace your creations are always perfection! I just love what you have done on this card! Just BEAUTIFUL! Thanks so much for joining our "ANYTHING GOES" challenge at Shelly's Images! Please come back and join us again real soon!! I love this verse and such pretty layering! Beautiful card, Grace! I love the layers, the seam binding and the flower! But my favorites are always the sentiments that you use! Enjoy your grands this weekend, and blessings! This gorgeous card looks like it was hard to make! Wonderful, and the new dies are out-of-this-world! Hugs! Soooooo pretty! I love the tiny flowers on the pink panel and how you coordinated the bow and stick pins with them. The shape of the card is wonderful, and the lacy layers are so very special! A perfect place to showcase such an encouraging scripture! This is just Stunning, love the use of all the dies. Oh how beautiful Grace!! I love your colors, your framing of the verse and all the layering!! Gorgeous my friend!! 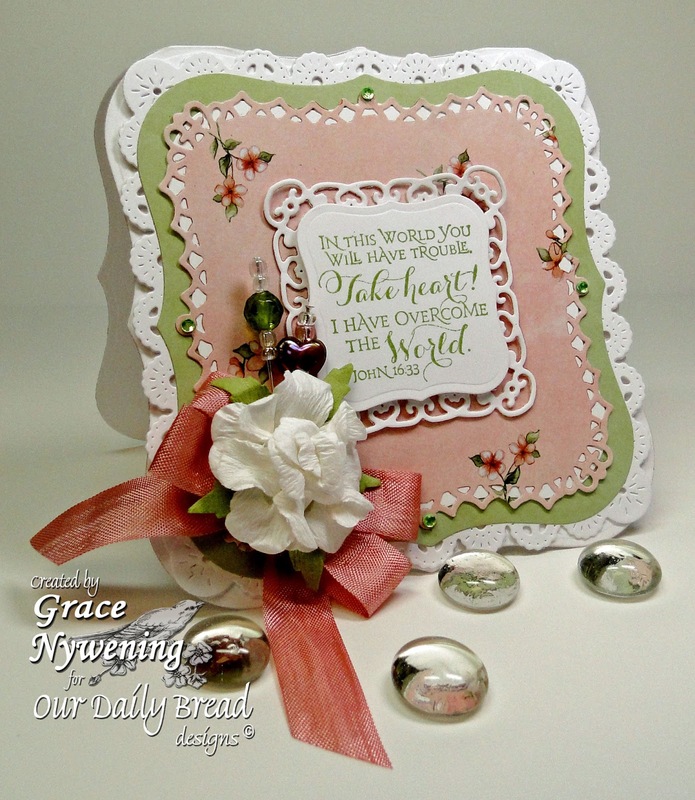 Grace this is so beautifully designed and the colours and embellishments work so well together. Wishing you a fab Thursday. O yes its takes my Heart away, its extraordinarily eye catching.Thanks for joining with us at My Heart Pieces.